Though a regular visitor to Meherabad for over 40 years, I never had an occasion to meet him until recently. He has the pedigree, in a manner of speaking. He played hide and seek games in Guruprasad as the Avatar was holding ‘sessions’ with Mandali and visiting lovers. He proudly remembers annoying none other than Beloved Baba Himself with his childhood pranks. ‘I saw Baba in real angry mood one day,’ he recalls and tells you, without any prompting, ‘These days you see only a smiling Baba. The angry Baba photos are not shown to you’. Lord Meher records in detail several occasions when Baba had bouts of anger but I don’t think anywhere in that tome, one comes across a single photo to show the mood swings of the Avatar. It is possible that either when Baba was physically amongst us or after He made the Samadhi his eternal place of rest, a decision was taken to keep ‘angry Baba’ out of every one’s reach. Well, this is understandable because there are no stories heard or said of a visiting lover ever seeing the Beloved in any mood other than smiling and benevolent. To get back to the story of this friend, whom you can see zipping past you to the Hill on his two-wheeler at all times of the day, he tells you with a chuckle that he had invited the ‘wrath of Eruch Uncle’, as well. ‘But Eruch Uncle is Eruch Uncle. He just laughed heartily after a while and spared me the rod’, he says apparently trying to relive those moments. Funnily, rather interestingly, in fact, he has not lost the childhood jest. Nor the child’s tendency to see everything through a black and white prism, though his six-foot tall frame has become nearly 60-years –old, and he has had stints in the security in and outside India. Probably, the living and breathing of security environment makes him, just as it does for scores of former service personnel, a bit difficult to adjust to the civilian set-up, where, rather than efficiency, ability to drop names and contacts with the who is who of the surroundings matter. I forgot to ask him how he came to see Baba and believe in Baba. For answer to these questions and more about his own days at Guruprasad, Meherazad and Meherabad, we may have to wait till he completes his ‘book’. From the limited interactions I had with him, I am sure the ‘book’ will be a veritable mine of stories and anecdotes not heard so far. Like a true soldier with the gun in the wild which he was once, he is now with a pen, digging deep into his own memory and into the stories his mother and relatives had told him. When I remarked that the ‘book’ will be a veritable mine of information, I really meant it. If memory serves me right (I spoke to him more than two months ago), their house in Pune was not far away from the house of Shreenmai, the Mother of the Avatar. And a brother of his father was a childhood friend of Beloved Baba. Yes, your guess is right. The ‘hero’ of this narration is Farooq Bastani. After wandering the world, he has settled down in Meherabad with a house in the Meher Colony. The Bastanis have a special place in Baba lore. Farooq’s mother was always on hand in Pune to Baba and the Mandali. She saw her Zoroaster in Baba. Baily (Bastani) Irani was special to Baba not merely because he was a childhood friend but because he was an effective instrument to the Avatar in carrying out His universal Work. Farooq’s narrative, I understand, will draw heavily from the unpublished narratives of Baily’s days. During his last days, Baily reportedly told the family and friends to hold on to Baba. ‘He (Baba) is God. Follow Him’, he is believed to have said, notwithstanding the many (some unsubstantiated) stories in circulation on and about Baily, which tend to give a contrary view of this great man. 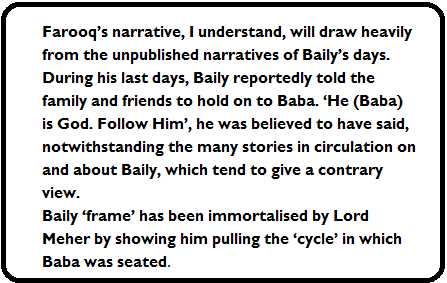 Baily ‘frame’ has been immortalised by Lord Meher by showing him pulling the ‘cycle’ in which Baba was seated. 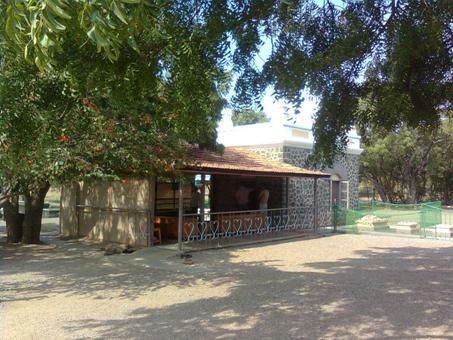 Meherabad is a place where many questions are answered and some remain unanswered. One such unanswered puzzle is Farooq Bastani. As I said at the very outset, he has the pedigree, which should be the envy of his best friends. Not many in the contemporary Baba community can claim to have had the access to Baba, he had as a child. Nor are there many for whom the Men Mandali were dear Uncles and Women Mandali were the pleasant Aunties. And, from whatever little I have observed, his credentials as a Baba lover are impeccable. In his love for Baba, and in its expression, there is no Teflon. Unadulterated. Pure and simple. Whatever he wants to do, he tells Baba and only when Baba says yes, he proceeds. Otherwise he simply drops the plan, unlike many who keep pestering Baba to say yes to what they want to do. Mind you, Baba is really fun loving. When you pester Him, He agrees to your plan and soon you will find yourself in hot waters, which makes you run back to Him with Repentance Prayer on the lips. I can cite several examples of this kind. Yes. From my own life. Once I was keen on taking up an assignment with a magazine. I believe that I have the expertise to bring out a magazine all alone. Baba said no. I did not give up. I persisted. After getting the green signal one blazing afternoon, I took up the job. Soon I realised that I was on highway to ruin my hard earned reputation. And I ran away from the place after the first issue was published and ignored all the temptations to return. When the Avatar says no, we should learn to accept the no. Well, that is obedience- Mandali has set the shining example of obedience in action for this Avataric period. I have no hesitation to say Farooq Bastani has imbibed that spirit of obedience. I began the column with reference to Farooq Bastani’s encounter with Beloved Baba’s ‘anger’. In the days of Kasbapeth and Manzil-i-Meem, Meher Baba is known to have displayed ‘angry flashes’. There are not many instances of ‘angry’ flashes afterwards. May be a result of his child encounter with the ‘other side’ of Baba, Farooq Bastani’s USP these days is angry bursts. These do not last more than a few seconds though. His anger serves a purpose, in a manner of speaking. People working with him or interacting with him just do as he wants them to do. From the mason to the water man and to the contractor, whoever is around, anyone. Like disciplined soldiers. I will be unfair to myself and to the reader if I don’t say that I also faced ‘Farooq Bastani’s anger’. By habit and temperament, I avoid rubbing anyone on the wrong side, and being a habitual loner, I generally keep myself unto my books, and my computer. So I could see his anger against me was a misdirected missile. Because most of what he says is ‘abracadabra’ to me. Farooq Bastani expects everyone to know the story of Baba and of all the players in ‘Baba leela’. He gets irritated when the uninitiated, like me, pushes the buttons and asks- who, where, why and how, just to keep track of what he is telling. So, I kept my cool. I still greet him when we come across each other. He, however, avoids me, like a child upset at not having his way. Yet, I cannot help admire the child in Farooq Bastani. 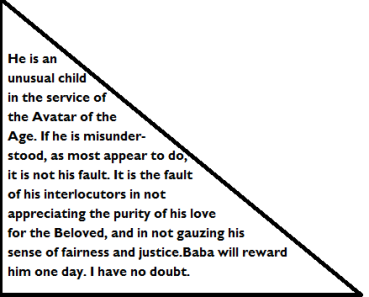 He is an unusual child in the service of the Avatar of the Age. If he is misunderstood, as most appear to do, it is not his fault. It is the fault of his interlocutors, if the the purity of his love for the Beloved is not appreciated, and if his sense of fairness and justice is not welcomed. He has the merit and training to shoulder great responsibilities in Baba’s service. Baba will reward him. I have no doubt. Age is on his side, which is a big plus. 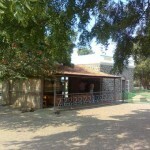 This entry was posted in Meher Baba Speaks and tagged Bastanis, Guruprasa, Lord Meher, Meherabad. Bookmark the permalink.